Don't worry. These aren't really acorns. That would be ridiculous, and slightly outdated, right? I can't remember the last time I saw a walnut in the grocery store. Or in someone's kitchen. Unless it's Christmas, and they're covered in chocolate, and even then you always dodge those for the good stuff. Rabbit trail. Back to the topic, which is a combination of a) donuts, b) chocolate, c) chocolate sprinkles, and d) pretzels. That's it. Four easy-to-find, inexpensive ingredients, and you have quite possibly the cutest fall dessert you can imagine. I mean, really...who doesn't love a donut? You hardly need any of these, because I snapped each pretzel stick in half and used it on two donut holes. Melt the chocolate over the stove at a very low heat. Continue to stir until completely melted and smooth. 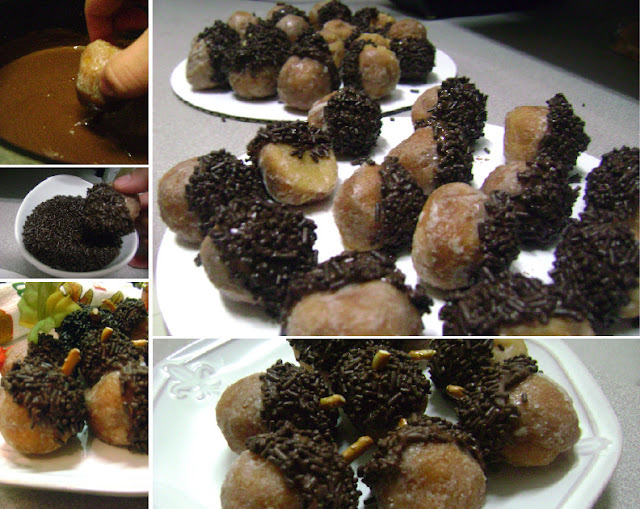 Dip the tip of the donut hole into the chocolate and dip in chocolate sprinkles. Place on wax paper. Place donut holes in fridge and let cool and harden slightly. Stick half of each pretzel stick in the top of each donut hole. Keep donut holes in the fridge until you're ready to serve them. I made two dozen of these, and it cost $11. That's not too bad to treat your co-workers, right?